ON FRIDAY, 50 Jewish and Muslim activists gathered outside the office of Brooklyn State Senator Marty Golden. Some sat on stools and crates as if sitting shiva, others stood holding signs. At their feet, a banner read, “Tell white supremacists they don’t have a place in your party.” And placed on the banner were 11 kippot bearing the names of the 11 Jewish congregants killed at Tree of Life synagogue in Pittsburgh. Together, the assembled recited the Mourner’s Kaddish. Golden, who’s seeking his ninth term as the state senator representing a gerrymandered swath of South Brooklyn, was nowhere to be found. His re-election campaign has become a local microcosm of a national reckoning over the rise of racist nationalism in the United States. Thursday evening, an event featuring his Democratic opponent, Andrew Gounardes, was cancelled when antisemitic graffiti was found in the stairwell of the historic synagogue where the event was to be held. The event’s host, Broad City actress Ilana Glazer, told the crowd of attendees outside she didn’t feel comfortable ushering 200 people into the enclosed space. “About 30 seconds before we pulled up, we got a text saying the event was canceled for safety reasons,” Gounardes told Jewish Currents. “When we arrived, we saw everyone pouring out of the hall.” Gounardes went inside to meet his staff and talk to the organizers. “The irony is we were coming from a vigil in Bay Ridge for the victims of Pittsburgh and Louisville,” Gounardes said. Earlier this year, Golden was forced to fire another staffer, Anthony Testaverde, after he shared posts on Facebook comparing the Parkland survivors to Hitler Youth. “It’s a very clear question: you either draw a line at white nationalist violence, or you don’t,” said Sophie Ellman-Golan, a member of The Jewish Vote, who helped organize Friday’s action at Golden’s office along with members of Yalla Brooklyn and the Muslim Democratic Club of NY. “It’s very clear Marty Golden does not. We’re asking him to fire Ian Reilly. We are asking him to unequivocally denounce white nationalist violence.” The Jewish Vote, with IfNotNow, HIAS, and other progressive Jewish organizations, helped organize a vigil for the Pittsburgh victims in Union Square last week. But Liam McCabe, a GOP operative and member of the Brooklyn Republican Party’s Executive Board, went to bat for Reilly and his boss. “If Marty fires Reilly, it sets a bad precedent,” McCabe told me. “It’s an unfair attack. And it holds Marty to a standard the left is not holding Andrew Gounardes to,” he said, citing Gounardes’s endorsements from Reform Party chair Bob Capano, who used Islamophobic rhetoric to smear then-city council candidate Reverend Khader El-Yateem in 2017, and Arab American activist Linda Sarsour, infamous among conservatives for unapologetic leftist and pro-Palestinian statements. But unseating Golden won’t be easy. He has kept the seat for 16 years by consistently turning out conservative white voters in the district’s tonier neighborhoods. Gounardes will need a Democratic turnout that’s at least as big as optimistically projected, especially among young voters, Arabs, and immigrants. Gounardes told me he worries these attacks—and the rhetoric from the right—are part of an effort to strike fear into voters. On Friday, Golden’s campaign Twitter account sent out a “public safety notice” that the Gounardes campaign was “asking our neighbors to share – with strangers! – when their homes & apartments will be empty.” The tweet referenced standard get out the vote campaign literature which asks people what time of day they plan to vote. “This is not covert voter suppression, this is overt, explicit, direct attempts to engage in voter suppression of the worst kind,” Gounardes told Jewish Currents. 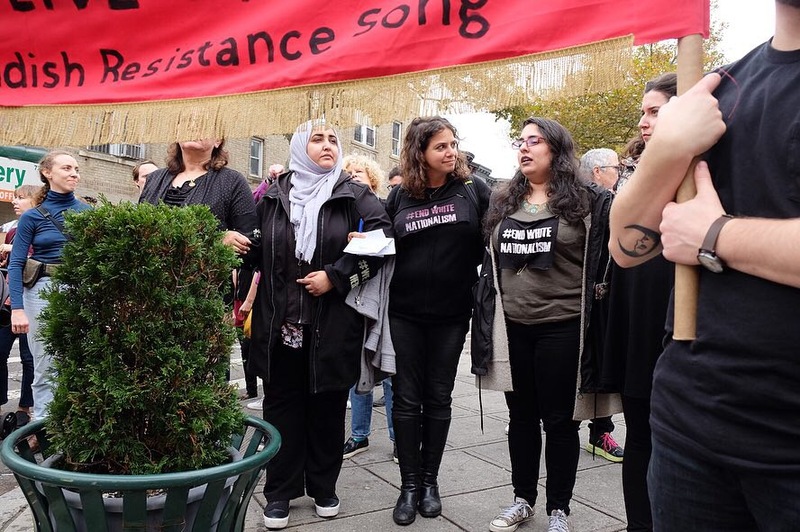 After their prayers at Golden’s office, protestors marched to the Islamic Society of Bay Ridge as Tsibele, a local klezmer band, played in time. At the front of the group, young activists held aloft a banner. In Yiddish it read, “Mir veln zey iberlebn”—we will outlive them. It’s cold comfort. But if the GOP’s nationwide efforts to suppress the midterm vote succeed, it may be the only one they have. Sam Adler-Bell is a writer and researcher in Brooklyn.